Newfield Exploration Co. is drilling a horizontal well in the “Stack” oil play in Kingfisher County. The study by the Oklahoma Oil & Gas Association is based on 2015 and 2016 operating results from horizontal wells drilled by four leading producers in the Stack region. The four companies are Chesapeake Energy Corp., Devon Energy Corp., Marathon Oil Corp. and Newfield Exploration Co.
>According to the analysis, a typical Stack horizontal well operated by those companies will have produced 50 percent of its estimated lifetime crude oil production by the end of its third year. >An estimated 37 percent of a typical Stack well’s natural gas production will have occurred by the end of the third year. The projected three-year declines are less steep than those calculated in an Oklahoma Watch study of all Oklahoma horizontal wells that started production between February 2014 and January 2017. Both studies assumed the wells would produce for 30 years. The Stack region is concentrated in Kingfisher and Canadian counties and includes portions of Blaine, Dewey and Custer counties. Companies have continued to drill wells there despite falling oil prices. The Oil & Gas Association said the Stack is expected to remain the state’s most active area of development as long as prices remain low. Donelle Harder, association vice president, said the organization was convinced that its Stack study provided a better indication of future production levels than broader studies, particularly with oil prices hovering around $45 a barrel. Harder said nationwide drilling rig counts show that about half of the rigs currently active in the state are operating within the Stack play. Harder said the less steep decline curve plotted by the association might reflect the possibility that oil-producing geological formations in the Stack region have different characteristics than those in other parts of the state. Improved completion techniques could be causing decline curves to become sharper as more production is captured in the early months and years of a well’s lifetime. At the same time, Harder said, other factors might bend the production curve in the other direction over time. 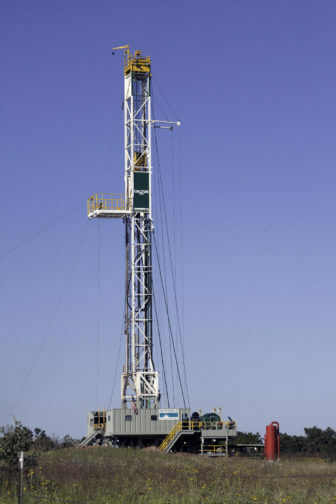 She said Texas producers have begun “re-fracking” older horizontal wells after several years of production. That tends to reinvigorate production levels. If that practice became widespread in Oklahoma, it would stimulate more production later in the well’s lifetime.